The news from Louisiana is often hurricanes, burst levees and the dangerous streets of New Orleans. What we’ve discovered down South has been unreserved hospitality. A few years ago on our first trip through the Bayou State the weather turned cold. We became stranded in the town of Nathitoches, blind-sided by a gale of sleet. Thrilled locals informed us they hadn’t seen snow in NAK-a-tish (that’s how it’s pronounced) for nine years. As polite Canadians, we controlled our elation. As luck would have it we had arrived the day of the annual river-barge parade. We mingled with happy revelers on the banks of the Red River. As we strolled, the sound of a Cajun band spilled from an antebellum mansion fronting Front Street. The owner, a well-dressed southern gentleman, was watching the parade through his wrought-iron fence. Small talk ensued. Soon the wandering Canadians were invited into a stately pre-Civil War home to join a bon fête. The party lasted into the wee hours. Filet gumbo, stomping feet, a crackling fire and genuine Louisiana friendliness kept us warm. After much cajoling I joined the band, rang the Cajun ti-fer… and did credit to all Canadians – in the beverage consumption department. On our return to Louisiana this time we bypassed Natchitoches, hugging the Gulf Coast, seeking the blue bayou of the South. Roadside billboards stuck in the swamp advertised free consultation to shrimpers still affected by the Deepwater Horizon disaster. The ex-lawyer in me was intrigued. The guy seeking quiet solitude was – quietly disgusted. The bayous of Louisiana start where the Mississippi River begins to end: in the silted course of its enormous delta. Braided channels open and close. New rivers form. Shallow meandering creeks emerge in swamps overgrown with cypress and mangrove forests. These muddy backwaters are the birthplace for a vast array of aquatic life. Their predators – birds and reptiles – lurk quietly in the sultry stagnant shadows. When we arrived at the Morgan City campground it was dark. We were hungry, tired, irritable – and without a reservation. Most horrible camping experiences begin with a late arrival. While attempting to set up in the dark I backed into the last open site, glancing off an oak tree and a concrete picnic table, fanning the fires of a simmering matrimonial dispute. I walked, fuming, past a campsite’s roaring fire toward the office to register. A happy group of tenters were huddled near the flames, laughing and smoking. “You were pretty lucky to get that spot on a busy weekend,” said the affable occupant of site B12. “Where y’all from? I told him we were from Alberta and said we were hungry and hoping to find a Cajun restaurant nearby. He recommended a place in town down by the Riverwalk and wished us a pleasant evening. My mood was greatly improved when we drove back through the gate a couple of hours later, stuffed to overflowing with crawfish and dirty rice. The small group settled around B12’s fire was well into their cups and still going strong. My relaxed demeanor confirmed we had not been led gastronomically astray. “Why don’t you and your wife come on over for a drink?” asked the friendly fellow who was responsible for my contented smile. I slipped into our RV and grabbed a couple of Pilsners I had lugged from home. I handed a cold one to Dean Landry and his wife Vicky. “These all the way from Canada?” Dean asked. “How come he talk so funny?” asked Zach, Vicky’s precocious twelve-year-old. “Sshh, you mind your manners,” said Miss Vicky. I reached into my pocket and handed Zach a blue, five-dollar bill. I proudly told him it was worth almost $4 American and that it was now his. “This’s made out of plastic,” he screamed, running through the campground, announcing to the world that some geezer from Canada had just given him a foreign blue fiver. “Why you come down to these parts?” Mr. Landry asked. His surname and that unique Louisiana cadence confirmed his Cajun ancestry. “Not particularly,” I replied truthfully. “I live only a little more than fifty mile from here, up near Thibodau, in Lafourche Parish.” Unlike the other 49 States of the Union, which have Counties, Louisiana is divided into Parishes – further tribute to its French roots. We’d had a few brewskies by then – and I don’t put a lot of stock in late-night campfire bravado. So when I popped my head out of the camper the next morning my expectations for a bayou experience weren’t high. “There you are,” shouted Dean, wiping down the lovely flat-bottomed craft that had appeared at his site. He’d driven 80 kilometers to his home, breakfasted with his daddy, hitched up the boat and returned – all while I was still sawing logs. “And he’s been polishing that motor for near an hour now,” Vicky smiled. My mother told me I’d never amount to anything if I didn’t get up early and get to it. But somehow serendipity follows my late-morning shadow, shaking me awake with fortunate encounters. Vicky, Zach, my wife Florence and I jumped into the boat and Dean motored us into the bayou. The perspective from water was entirely different from the bits of swamp we could see while driving. Narrow muddy channels serpentined every which way and within minutes I was completely lost in a vast wet labyrinth. The gators were out, sunning on logs or floating motionless, eyes protruding silently above the water. These malevolent-looking reptiles can grow to four meters and 400 kilograms – top of the food chain in these hidden warrens. In the bayou it’d be easy to dispose of things unwanted. I was glad Dean was a friendly chap. Zach acted as lookout, chatting constantly, identifying all flora and fauna the bayou had to offer. An abandoned orange hurricane pod, resembling a wayward UFO, floated uselessly in a backwater, testament to the unrelenting power of Mother Nature. We moored for lunch at Gros’ Place, a remote camp accessible only by water. A huge kettle of fragrant jambalaya boiled above an open fire. A fresh-dressed deer carcass dangled from a hook in the kitchen. After a meal of fried catfish and white beans – and an afternoon of great camaraderie, Dean steered us out of the bayou, effortlessly retracing our path through the indiscernible twisting, turning channels. The sun, shining through a thick canopy of cypress and mangrove, hinted vaguely at our direction of travel. If there’s one thing I can’t stand it’s a know-it-all kid. I thanked him for his advice and drove off. “That kid is either a savant or a nut,” I said to Florence. Less than a hundred kilometers down the road a yellow warning light flashed on the dash. I pulled over. The owner’s manual indicated there was a malfunction in something called the DEF. The problem required immediate attention. After twenty ignition starts the vehicle would be rendered inoperable. I stopped at an Auto Zone and explained my problem to the man behind the counter. “You need to add DEF fluid. It’s over there behind the antifreeze. It’s really just urea,” he said in a thick Cajun drawl. 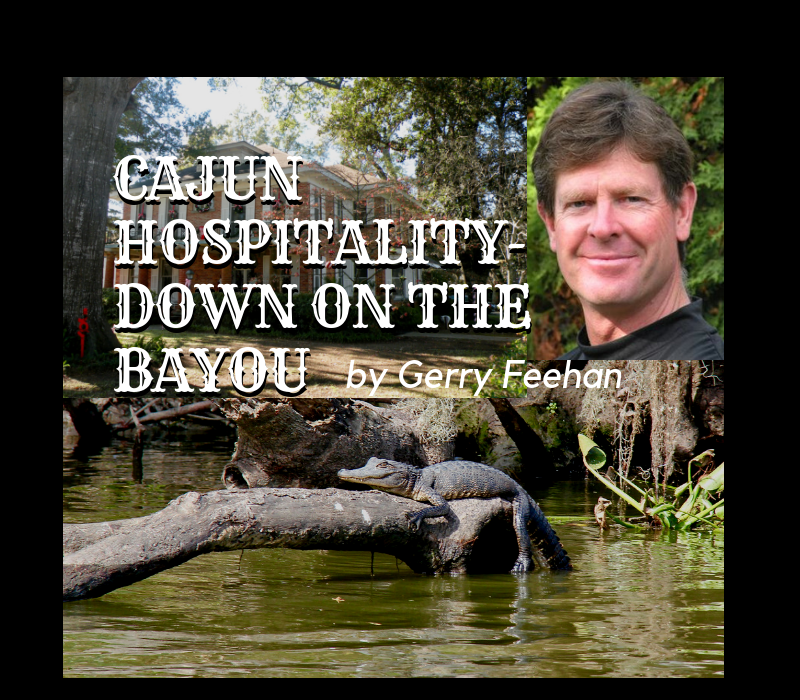 Gerry Feehan QC practised law in Red Deer for 27 years before starting his second life as a freelance travel writer and photographer. He says that, while being a lawyer is more remunerative than travel writing, it isn’t nearly as much fun. When not on the road, Gerry and his wife Florence live in Red Deer and Kimberley, BC. 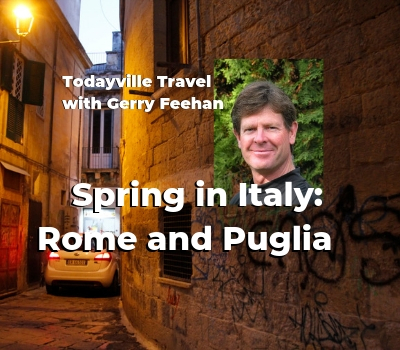 Todayville is proud to work with Gerry to re-publish some of his most compelling stories from his vast catalogue developed over more than a decade of travel. THANKS to these great partners for making this series possible. On a lonely country road near Ostuni, in the Province of Puglia – the heel of Italy’s boot – I stopped to photograph a field of poppies in an olive grove. After a few happy snaps I jumped back in the car and motored on. Fifteen minutes later I reached for my daypack and realized in horror that I had left the pack (complete with camera lenses and phone) on the rock wall that fronted the poppy field. We sped back. The bag was gone. Impossible. We hadn’t been gone half an hour and there were no other cars on the road. An hour later we were disconsolately packing up when a faded 1960’s era Fiat Panda pulled up and stopped tentatively beside us. An elderly man with glasses thick as an olive-oil bottle gazed out from behind the wheel. He eyed us with a mixture of suspicion and curiosity. A young boy with equally opaque glasses – obviously a blood relative – peered shyly from the passenger seat. Together they began a lengthy, incomprehensible Puglian discourse – and only when satisfied that we understood the situation, did they proudly retrieve my bag from the back seat. For years my patient wife has been suggesting, “We should spend a month in Italy.” And for ages I nodded – and deferred. But last spring when the annual request edged toward an ultimatum, in the interests of marital harmony, I acquiesced. As seasoned travellers we often tour by the seat of our pants, plans random, frequently pulling into a strange town late afternoon searching for accommodation. This has worked well in some places but, in a country where you no speaka da lingua, advance booking is wiser – and infinitely less stressful. So when the plane touched down at Rome’s Leonardo da Vinci Airport in early April, our four weeks of lodging – three nights here, four nights there – were all booked. Even our ride into Rome was arranged. A driver awaited us, patiently displaying a “Mr. and Mrs. Feehan” sign. And twenty minutes later we were checking into a quaint B&B steps away from the Vatican. We didn’t organize this trip on our own – nor did we use a tour company or travel agent. 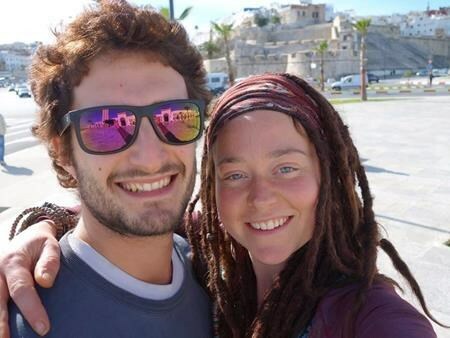 We employed a much better resource: Sandy, an acquaintance who loves Italy, has been there many times and knows exactly where to direct a couple of adventurous travellers in the land of the Azzurri. Our friend fashioned the entire itinerary: four days exploring Rome, ten days in the south, a few days biking near San Marino and a final 10 days in the rolling hills of Tuscany. Her planning was so meticulous (right down to AirB&Bs in the heart of each town plus offering detailed day-trip ideas) that I feel we owe her a substantial commission – or maybe just a nice spaghetti dinner. Rome is a remarkable, fascinating place. This ancient capital of the empire is overflowing with architecture, museums, statuary, Roman ruins and wonderful old neighbourhoods. And despite the sprawling megalopolis that is modern Rome, its iconic sites (the Coliseum, Forum, Trevi Fountain, Spanish Steps, Pantheon and St. Peter’s) can all be visited in a day’s stroll. But Rome is overwhelmed with tourists. On average 40,000 people a day cue up to shuffle obediently through the Vatican and the Sistine Chapel. April is allegedly shoulder season – and we had booked a “private tour” – but we still had to share Michelangelo’s artistic brilliance with a giant throng of gawking souls, heads uniformly craned toward the majestic ceiling. Like many big cities Rome is a little seedy. Pope Francis has allowed the homeless to camp within meters of St Peter’s Square. Unfortunately this generous gesture does not add to the curb appeal of the Basilica. We felt a little uncomfortable at night, dodging snoring vagrants, cardboard houses, used needles and other discarded paraphernalia. I’m not a big city guy so after four days with the hawkers and beggars and tourists snapping pictures with their “selfish sticks” I was happy to pick up our rental car and head for sleepy Puglia, in Italy’s delightful south. Although it has millennia of history, Italy is actually a new country – only a few years older than Canada. Giuseppe Garibaldi rode in on his horse and unified all the disparate kingdoms in 1861. But even today northern Italians tend to look down their noses at their southern brethren. And reciprocally a hint of proud defiance defines the Puglian character. Puglians are defiant- but fashionable! Our first stop in the south was Matera, a UNESCO world heritage site renowned for its cliffside cave dwellings or sassi. These grottos have been continuously occupied since Neolithic times and the humble Materans are enormously proud of the “negative architecture” of these underground abodes. One warm afternoon while we strolled a grassy cliffside path, a well-dressed middle-aged man stepped out from the shadows, cigarette dangling from his lips. He introduced himself as Fabrizio and invited us to visit his family sasso and the kitchen where traditional (tipica) food was served. “Quanto?” I asked suspiciously, concerned about the cost. “For the cave, free,” he said, “and if you wish something to eat, you decide what to pay.” It was nearly 1 p.m. and we were somewhat peckish, so we warily accepted his invitation. Thus began the most interesting and enjoyable afternoon of our Italian visit. After showing us the intricately hand-carved rooms where the ancients slept and stabled their animals – as well as the cisterns where water and wine were stored – Fabrizio led us up a narrow passage to his open-air kitchen overlooking Matera. Then he started the service. First, the antipasti: crusty bread with four olive oil dips, each infused with a local herb, then bruschetta made from shredded garlic and ripe dried tomatoes, then an amazing assortment of meats, cheeses and vegetables. I was nearly full when out came two different soups, a hearty beef broth and a lentil stew. Next was a crisp pizza. I quietly undid my belt beneath the table. Fabrizio chatted constantly while he worked – a knowing smile on his face – educating us on local foods, customs and lifestyle. There was also an unending supply of wine, “vino rosso della casa,” vinted from primitivo grapes, which have been cultivated in this region for thousands of years. There were so many courses I can’t recall them all – fish and more cheese were in there somewhere – but I know we finished with dolce (sweets) and a jolt of espresso. Fabrizio’s motto is “less is more” but I’ve rarely eaten more in one sitting. Three hours after stumbling in on this amazing gastronomic and cultural experience, we stumbled out into the late afternoon sun. As we left Fabrizio called out, “Won’t you have some pasta Bolognese?” I think if we had kept eating he’d still be bringing out dishes. And what was il conto you ask? He humbly, delightedly accepted 40 euro – about $60. A couple of weeks later on the flight home, over the drone of jet engines, I asked Florence, “Why did we wait so long to visit Italy?” She raised her eyes toward the heavens, shook her head and said, “It must have been a conspiracy.” Then she smiled and nodded off. Enjoy an excellent adventure in Texas. Click below.